Let’s face it. Most of your salespeople don’t like using a CRM system. They don’t like the manual data entry that’s involved to update it. They don’t like to spend endless hours doing reports. And most frequently, they complain about their CRM system not being user friendly. But as much as you can blame your CRM software, you can also blame the way it’s been setup, the way it’s been implemented and managed. So how can you make your CRM system friendlier and get your salespeople to embrace it? Most often, salespeople feel that there are “too many clicks” to enter a new potential, or a task, or any information related to a customer record. Well, now they can end all their woes by performing subsequent activities from one place. 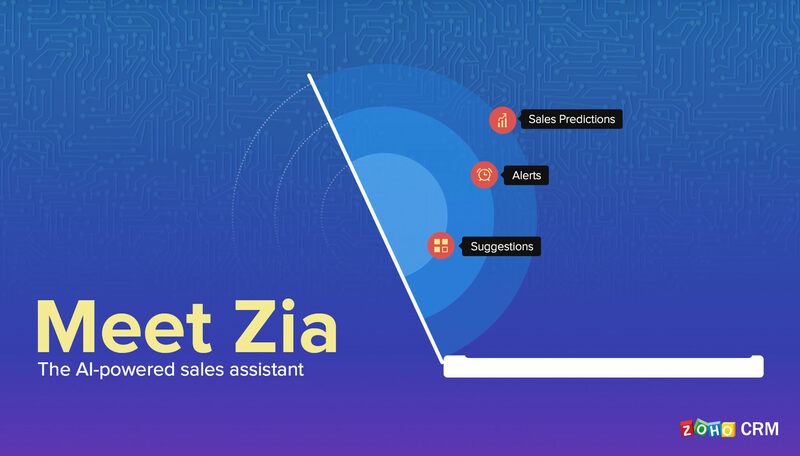 Quick Actions and Related Lists in Zoho CRM help your sales reps perform actions instantly without navigating between modules. 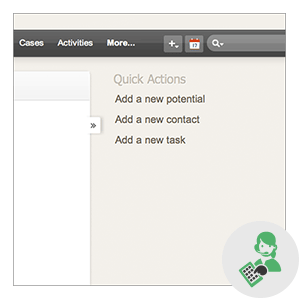 Quick Actions lists all the subsequent activities for a customer record. Say for instance, you’ve added a new account and you want to add a new potential for that account. Instead of navigating to the potentials module, simply click “Add a new potential” from the accounts page to instantly add a potential for the account. With Related Lists, your sales reps can view all the records associated to the parent record. So it’s one place for a wholesome view to track everything that’s happening with the customer. Integrated with other apps and want that information in your CRM system? No problem. Just write your own custom functions or get it from the gallery, and bring your third-party application’s information right inside Zoho CRM. Too Much vs. Too Little Information. How to strike a balance? No one likes to fill in endless forms. Certainly not your sales team! The most frequent complaint from salespeople is that there is too much manual data entry, which decreases their productivity and diverts them from selling activities. But this task can be done in split seconds and yet allow them do what they do best, which is SELL! Reduce the number of fields in forms. The customer information forms usually have fields that are not quite necessary, and when not filled, makes your CRM database look starved for information! Use Page Layouts to keep form fields to the minimum. This way your sales reps fill-in only the required information and your CRM database looks complete too. Are all your data in Spreadsheets? Just Import them. Most of your salespeople are comfortable retaining information in spreadsheets because it’s easy. Or, that’s what you think. But they actually dread the fact of manually entering that mountain of information into a CRM! Well now they don’t have too. Each module in Zoho CRM has an Import option that allows them to import plenty of file formats. So the next time, don’t fret if you have information in spreadsheets. Just import! Use Apps to update Zoho CRM. Your sales reps are back from a trade show, and tagging along with them are a stack of business cards with notes written on it. By the time they are manually fed into your CRM system and followed up, there are minimal chances of converting those leads into opportunities! Here are two apps that directly capture attendee’s details directly into Zoho CRM from your iPhone – Leads and Card Scanner. It’s simple and quick. Just scan the QR code in the attendee’s badge, or take a picture of their business card. And simply follow-up with the attendees quickly by assigning a lead owner or send a follow-up email right from the app, all while you’re still at the trade show. Doing reports is one activity your sales reps absolutely dislike. You know it and yet, you ask them to do it. 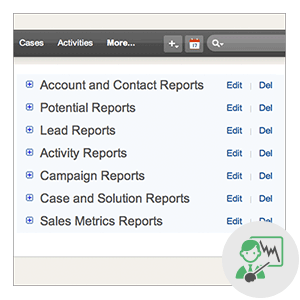 But with the built-in Reports and Dashboards module in Zoho CRM, doing reports can be a breeze! For starters it’s built-in your CRM system. So all the information from your CRM database gets reflected in the reports. And it does not involve any integration and no complexity! All that your sales reps have to do is call up a standard report and send it to their managers. They can also schedule and send reports periodically via Email. Now that’s definitely going to put an end to the long hours of working on reports, right? So these are 3 useful tips our salespeople follow at Zoho Corp. Let us know your tips and tricks in the comments below. When is the app for andrioid ready? Can I use QR codes with Custom Modules? I would like to be able to scan data and have it import to applicable fields in the CRM. Off course, if you don’t have the fields, you can’t do anything ‘active’ with them as you can’t filter and use the related data – just look at it either on the record or through a report – which makes it fairly useless, ie. If I want to market to everyone with a lost opportunity of a certain type – I can’t do it ‘actively’ I need to create a report, export it, re-import it etc etc etc. rather than just creating a view and sending a mass email or sync with campaigns. As far as physical Business card scanners, is there one that will require less manipulation of the data to put it into ZOHO. Why 2 different apps for contacts and leads? Would integration not be more effective and less confusing? When can we get android apps? Our developers are working on the Business Card Scanner and Leads Apps for Android. We’ll definitely inform you once its ready for release.